Custom Byrd gift baskets are also available! Please contact custom@byrdcookiecompany.com or 912.721.1552 for assistance. From corporate gifts to wedding favors, custom items are a specialty at Byrd! We want to help you give the perfect special gift. With your great name and our great cookies, we can partner to deliver something special that will become a keepsake. Our custom Make My Tin program starts at $14.95 per tin--and a low minimum of 10 tins! 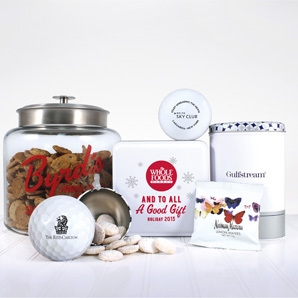 These tins are all filled with Byrd's Famous Cookies. We can also design custom gift sets around your items for those VIPs in your life. Custom cookie gifts make great party favors, birth announcements, thank you gifts, corporate calling cards or fundraisers. Questions? Please contact custom@byrdcookiecompany.com or 912.721.1552 for assistance. Please proof your custom label very carefully. You are completely responsible for all proofing. Please check all spelling, dates – days, months and years, and any other areas of verbiage. Check that the tin color, cookie flavor and quantities are correct as well. The customer will be held responsible for all orders as they are submitted. Custom tins cannot be returned for refunds.